After a busy summer of working on bikes in Newport and playing trombone with What Cheer? Brigade, I reluctantly left New England midway through cyclocross season to return to Medellin with Lenin. Two days later, we had secured a ride with his brother, Edwin, to Uramita. Within hours of this decision, our bikes were tied onto the roof of Edwin’s van, and all of our belongings were packed inside as we journeyed in the night along with 6 other family members through the mountains to their home pueblo, 3 or 4 hours away. 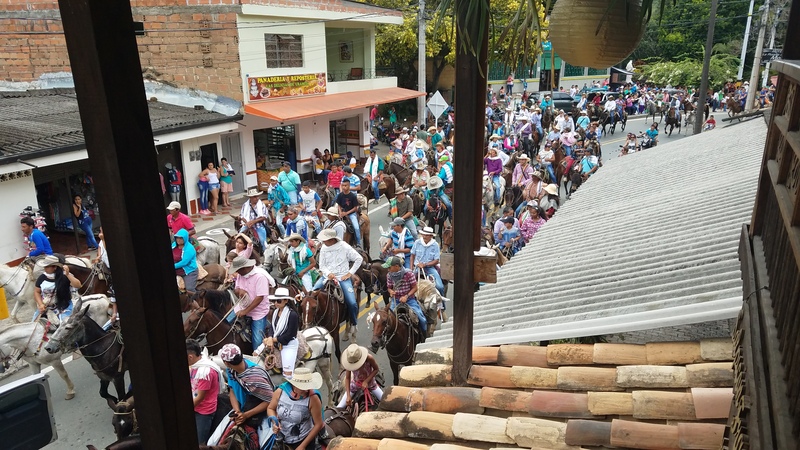 Part of the Fiesta del Campesino involves a parade of people on horses. We arrived around 1 in the morning, but the town was in the midst of a lively fiesta, despite heavy rain showers. This weekend Uramita was celebrating Fiesta del Campesino, a party that happens once every two years for the farmers and involves dancing to live vallenato music until sunrise. Lenin skates for the first time at the track in Uramita, nestled in the mountains. Exhausted, I just wanted to sleep. We spent the next few days talking to people, playing tennis, inline skating, and immersing ourselves in the community. One day we cycled to Frontino, a town just 25km away, but mostly uphill. We returned later that day to begin organizing our gear for another bike tour. Biking to Frontino from Uramita. Lenin had wanted to bike from Medellín to Uramita, but we ended up riding with Edwin to save time. Similarly, we were hoping to ride all the way to the coast, but we ended up hitching a ride on a bus that one of Lenin’s many cousins operates between Medellin and Turbo. We were missing a part for the rear bike rack, and we wanted to get another rack to install on the other bicycle, both of which were impossible to find in Uramita. The bus left us in Chigorodó, where we stayed with Lenin’s aunt for a day. 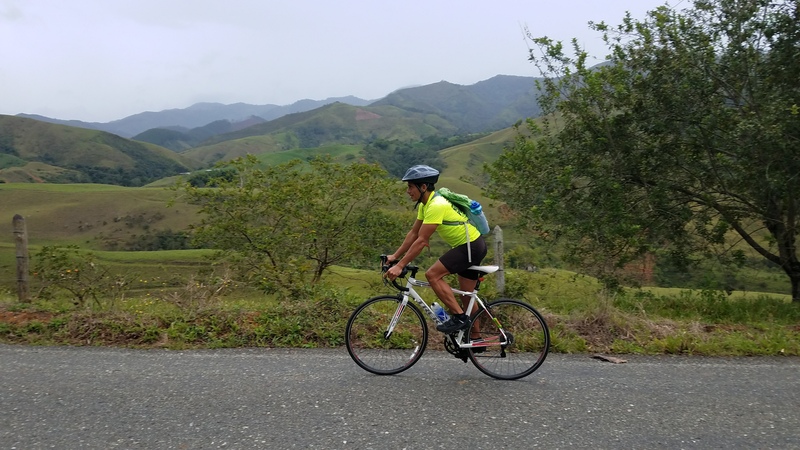 Chigorodó is part of Uraba, a region of Antioquia that stretches from Dabeiba to the border with Cordoba, and it is full of cyclists. People of all ages and on all types of bicycles constantly ride up and down the main road through the town, often carrying another person on the handlebars or top tube. It is not uncommon to see entire families balancing on a single bicycle, or someone using their bicycle to carry a large or heavy item such as furniture or a ladder. This was the perfect place to find the last few things we needed for our tour. Posted on 17 November 2017, in Bicycle Touring, Colombia - Medellin to La Guajira and tagged antioquia, bike tour, bike touring, bikepacking, colombia, cycling, frontino, travel, traveling, uraba, uramita. Bookmark the permalink. Comments Off on Another Colombian bike tour begins.